I found a way to make it happen, but it’s not easy. I’ll walk you through the problem, and how each way I attempted to solve it failed. All the names below are hypotheticals, and for the sake of argument we’re trying to make “foo.subdomain.local” resolve via the additional server. Suppose you have two DNS servers. One which we’ll call “NS1” and one which we’ll call “NS-NEW”. NS1 is a recursive server running bind, which all your clients point at to get their DNS information. It’s listening on port 53 as standard. NS-NEW is an authoritative server which is listening on a non-standard port (8600) and for these purposes it’s a black box, we can’t change its behaviour. You want your clients to be able to resolve the names that NS-NEW is authoritative for, but you don’t want to have to reconfigure the clients. So NS1 needs to know to pass those queries on to NS-NEW to get an answer. My first thought was to configure NS1 to slave the zone from NS-NEW. This didn’t work for me because NS-NEW isn’t capable of doing zone transfers. Pity, as that would have been really neat and easy to manage! Then I tried forwarding queries from NS1 to NS-NEW, by using binds “forward zone” features. This didn’t work because NS1 is configured to check for valid DNSSEC signatures. The root zone says that all its children are signed, and bind takes that to mean that all the grandchildren of the root should be signed as well. The software running on NS-NEW isn’t capable of signing its zone information. It doesn’t appear to be possible to selectively turn off DNSSEC checking on a per-zone basis, and I didn’t want to turn that off for our whole infrastructure as DNSSEC is generally a Good Thing. I did think I could probably work around it by making NS1 authoritative for the “local.” top level domain, then using NS records in the zonefile for “local.” to directly delegate the zone to NS-NEW. Unfortunately that doesn’t work either, as it’s not possible to specify a port number in an NS record, and NS-NEW isn’t listening on a standard port. Hold on to your hats, this gets a little self referential. To understand why this works, you need to understand how the recursion process for a query like “foo.subdomain.local.” happens. – do I already know the answer from a previously cached query? Let’s assume no for now. 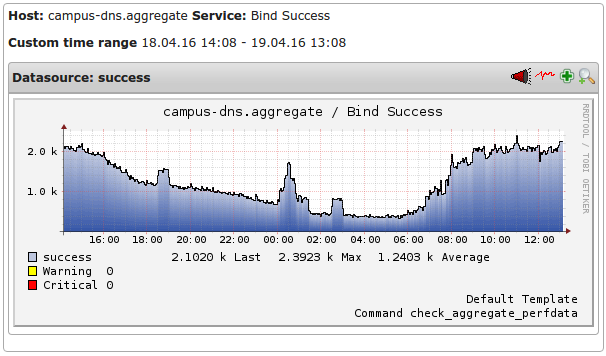 – do I know which DNS server is responsible for “subdomain.local.” from a previously cached query? Lets assume no for now. – do I know which DNS server is responsible for “local.” – ooh! Yes! That’s me! – now I can look in the zone file for “local.” and look to see how I resolve “subdomain.local.” – there’s an NS record which says I should ask NS1 in an authoritative way. – NS1 can then forward my query off to NS-NEW and fetch an answer. Because we haven’t had to go all the way up to the root to get our answer, we avoid encountering the DNSSEC issue for this zone. Did you really do it like *that*? The above is a simplified version of what I actually had to do, as our production equivalent of NS1 isn’t a single server – and I had to take account of our zone file management process, and all of that adds complexity which I don’t need to go into. There are also a few extra hoops to jump through to make sure that the “local.” domain can only be accessed by clients on our network, and to make sure that our authoritative infrastructure doesn’t “leak” the “local.” zone to the outside world. What would you have liked to have done? If NS-NEW was able to listen on a standard port, I’d have used a straight delegation to do it. If NS-NEW was able to sign it’s zone data with DNSSEC, I’d have used a simple forward zone to do it. NS-NEW isn’t *quite* the black box I treated it as in this article, but the restriction about not being able to make it listen on port 53 is a real one. 25 years ago today, the University of Bristol joined the Internet. Well, that’s the headline – but it’s not entirely accurate. By 1991, the University had been connected to other universities around the UK for a while. JANET had been established in 1984 and by 1991 had gateways to ARPANET so by the “small i” definition of internet we were already on the internet. These days, when we talk about “the Internet” we’re mostly talking about the global TCP/IP network. On the 8th March 1991, the University of Bristol received it’s allocation of the block of public IPv4 address space which we’re still using today. What follows is a copy of the confirmation email we received from the branch of the American Department of Defence (NIC) which was responsible at the time for allocating address space, and it describes the Class B network 137.222.0.0 had been assigned to us. cases where interoperability with MILNET is essential. network be used to indicate a broadcast datagram. described in RFC 826 is encouraged.